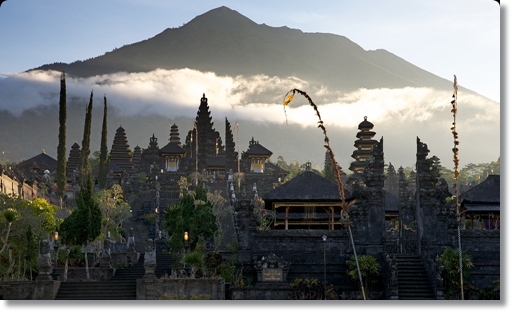 Besakih temple is well known as “ mother temple “ and the largest temple in Bali located in the southwest of Mount Agung. Besakih Village, Rendang Sub district, Karangasem District. Precisely at the foot of maount Agung, biggest mountain in Bali which height reaches 3.142 meters. Besakih temple has 298 buildings, one central temple called Penataran temple and 18 temples a facilitator ( 1 Basukian Temple and 17 other temples). Basukian temple believed by Hindus in Bali as a revelation to the Hindu religious leaders who come from India named Hyang Rsi Markandya The Founder of the Besakih Temple. Or Basukian Temple is the forerunner of Hinduism in Bali. While in Penataran Agung Temple there are 3 arca /Statues as Symbol of the attributes of gods( tri Murti ) Namely: Brahma God, Wisnu God and Siwa God , which is a symbol of the God as creator of this world, as a custodian and as fuser/reincarnation. Besakih Temple is the center of worship throughout the Hinduis in Bali, where all classes or caste in Bali to worship here. So during Hindu ceremony in Besakih Temple hindus thronged throughout the region.Besakih temple is Sad kahyangan temple means one of six general temple in Bali, the six temple namely : Lempuyang Temple(iswara), Goa Lawah Temple (maheswara), Batu Karu Temple ( mahadewa ) Punjak Mangu Temple ( sangkara ) and Besakih Temple ( Sambu ) is one of them. Besakih Temple called the attraction of the world where this temple has been nomination as a world heritage site in 1995. Has a special attraction for its existence temple surrounded by beautiful views from mount Agung,the temple its self, the scenery of rice fields and ocean scenery. Since Besakih nominated as world heritage the entrepreneurs engaged in tourism incorporate this attraction as their flagship tour program. Note: all temple in Bali for tourists are required to use sarong and completed with a shawl before entry, Before entering the temple area many seller hawking her sarong and shawls the price quite high . It is recommeded to bring a showl and sarong before visiting temples in Bali.